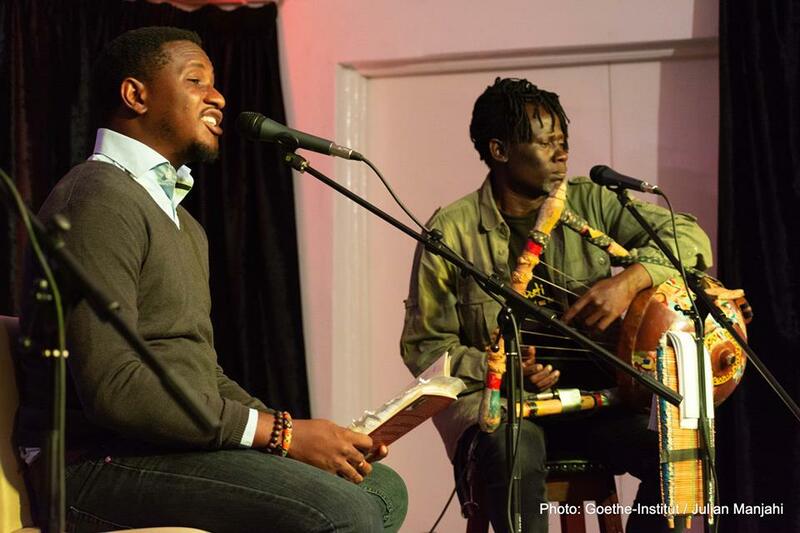 Nigerian poet Dami Ajayi and Kenyan musician Makadem made magic at the Goethe-Institut Nairobi on October 11, 2018. Their event which is part of the Artistic Encounters included a panel discussion moderated by Zukiswa Wanner. The Artistic Encounters evening at the Goethe Nairobi has quickly built itself as an evening that will deliver to its audience. Started in 2017 and curated by South African author and publisher Zukiswa Wanner, artists from different genres share a stage and wow the audience with their unique mix. The project has seen artists from Kenya, Nigeria, South Africa, The Gambia, and Sierra Leone in its two year run. Some of them include Lola Shoneyin, Victor Ehikhamenor, Koleka Putuma, Christine Kamau, Patricia Kihoro, Prudence Katomeni, Adipo Sidang’, Niq Mhlongo, Nick Ndeda, Olumide Popoola, Ngartia, Philipp Khabo Koepsell, Angela Makholwa, and Maimouna Jallow. Dami Ajayi the Nigerian poet who wears other hats that include music critic and doctor and Kenyan musician Makadem who plays several musical instruments were the featured acts for the evening. On their menu were a joint performance of Ajayi’s new poetry collection A Woman’s Body Is A Country being performed alongside the nyatiti played by Makadem. It was an unpredictable combination but the two artists gave a magical performance of two jamming sessions to the full house at the Goethe. Between performances, the two artists sat to talk about their experience as artists and the evenings show. They were moderated by event curator Zukiswa Wanner as well as getting questions from the audience. This would be followed by fans getting to buy the poet’s poetry collection and the musician’s music and have them signed. Below are some images from the events in the evening courtesy of the Goethe by Julian Manjahi. Full house for Dami Ajayi and Makadem at Goethe-Institut Nairobi. Photo/Julian Manjahi. Previous Previous post: Muhammad Abdelnabi is ArabLit Story Prize 2018 winner. Next Next post: Sihle Khumalo’s “Rainbow Nation My Zulu Arse” is here!